Recently, Kathleen Boshold contacted us hoping to learn more about one of her former teachers, Sister Agnes Celine Hammond. 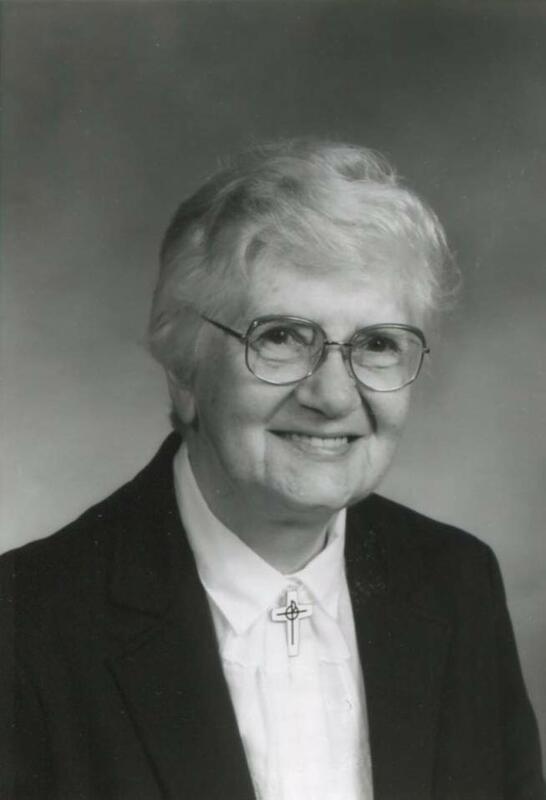 Kathleen, this week’s Throwback Thursday blog will take a look at the life and ministry of Sister Agnes Celine. Sister Agnes Celine was born Ruth Margaret Hammond on November 16, 1907, in Roxbury, Massachusetts, which is an officially recognized neighborhood of Boston. 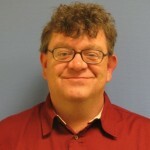 Her parents were named William A. and Mary Louise Shanley Hammond. Sister Agnes Celine entered the Sisters of Providence Congregation on February 9, 1926. She professed first and final vows on August 15, 1928 and 1933, respectively. Sister Agnes Celine graduated from Saint Mary-of-the-Woods College with a bachelor’s degree in music education and taught for 49 years in schools located in Indiana, Illinois, Maryland, Massachusetts, Washington, D.C. and North Carolina. 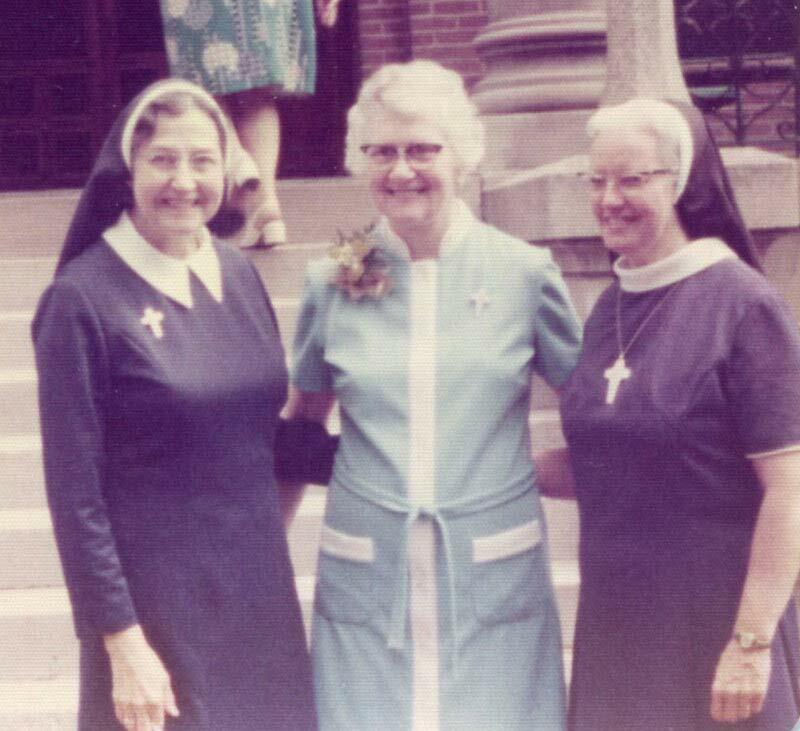 Sister Agnes Celine Hammond (center) with former General Superior Sister Mary Pius Regnier (left) and Sister Eileen Mary Cunningham in an undated photo. Among her stops were St. John School in Vincennes in 1931, Sacred Heart School in Malden, Massachusetts, from 1946 to 1949, and Immaculata Preparatory in Washington, D.C., where she also ministered as a secretary, librarian and cafeteria cashier. Sister Agnes Celine came home to the Woods in 1986 and began a ministry in health care, helping other sisters, until she began her ministry of prayer in 1996. Known as “Aggie” in the Congregation, Sister Agnes Celine was said to be a quiet person who also spoke in a quiet tone. Sister Agnes Celine died on December 30, 1998. She was 91 years old and had been a Sister of Providence for 72 years.